Going into “ethnic” markets (for lack of a better term) can be a perilous experience. For every time I pick up some dirt-cheap herbs and spices that I use the heck out of, there’s a visit where I come home with some Soviet-era tins of mystery fish, a jar of fermented tofu that ominously burbles away in the back recesses of the fridge, or an obscure vinegar that is good for one obscure dish that I’ve since lost the recipe for. You know what I’m talking about: those items that seem intriguing at the time but just gather dust on your pantry shelves until you finally, furtively throw them away. Despite these follies, I can’t resist a trip to an unfamiliar market when I pass one by in the ‘burbs. Sometimes these markets have prepared food, but they often lack seating and the quality can be hit-or-miss. That’s why I’m here, dear reader; I’ll do the heavy lifting for you. In the past I’ve hipped you to the hot dishes at Nam’s Oriental Food and Gifts, Cheung Hing, and Europa Food Market, among others. This time I hit up three area markets that serve Middle Eastern fare to weigh the pros and cons of each. International Market is adjacent to Toledo’s, which is a market that serves dynamite al pastor tacos (as covered in the January, 2010 MidMo). International’s been a favorite of mine for a while, and it can be very hard to decide between the two markets when I arrive. International Market has a limited menu of kabobs, sandwiches, and combo plates for lunch and dinner. The guys that staff the back of this small, crowded market are very talkative and friendly. When I asked one how steam table food can taste so fresh he answered that they cook the food 2-3 times a day, depending on the demand, and that they make everything from scratch every day, no leftovers. The combo plates come with boring dry rice and a big plastic bag of pita. That’s the bad. The good is that they are all served with creamy, smooth hummus, garlicky yogurt dip, crisp salad made with Persian cucumber, and a cute serving of house made pickled turnips. The meat is top-notch: moist, baby-fist sized spice-rubbed chicken chunks comprise the chicken kabobs and the long log of a lamb kabob is rich and gamy. The falafel balls are big and springy (stop snickering! ), with a coating of sesame seeds on the outside. International Market has two small tables outside that face out onto a dreary parking lot. It’s best for takeout. If you’re really hungry, get a taco next door to tide you over. The abundant promotional material in the windows at Babylon City Market and the cartoon logo of the be-toqued chef that adorns said material gives it the feel of a chain, but google reveals that it is not. This market is spacious and sunlit, with a side room devoted to bulk items (if you need some dirt-cheap bulgur or lentils), produce, and halal meat. There a small bakery in the back with an open, gas-fired oven that churns out hundreds of the football-shaped Iraqi flatbreads known as samoon. The café within the market is also in back, and ordering can be a chaotic experience. On the day I visited, the café had the only register open, so there were numerous families paying for carts full of food mixed in with the order line. There is quite a bit of seating in the front, and the long-ish wait for my food gave me time to shop and contemplate the variety of pickles and olives in the cold case. 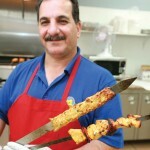 All of the sandwiches are served wrapped up in fresh-baked samoon, rather than pita. The falafel was nestled into the samoon with oily spears of fried eggplant and French fries. The falafel balls were cumin-heavy and reasonably moist. The chicken shawarma had a good flavor but the meat was dry – it could really have benefited from the “housemade special sauce” touted on the menu but nowhere in effect. Interestingly, it was topped with turmeric-stained lightly pickled cabbage. I threw in a couple of side dishes: the Middle Eastern pizza-like dish known as lahmacun and tabbouleh. Babylon served me a poor excuse for tabbouleh. Tabbouleh is all about the chop; that’s what makes it so much damn work. If the pieces are not small and uniform fuggedaboutit. This version had ragged, large pieces of parsley and was watery. Maalouf’s sets the standard for tabbouleh in Sac as far as I’m concerned. The lamacun had a layered, pastry-like dough and was topped with tangy sweet tomato and spicy ground beef. 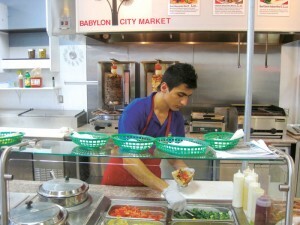 Babylon City Market has an extensive menu, including some dishes I’m not familiar with, and I’ll visit again. Mediterranean Market (why do these places all have such generic names?) 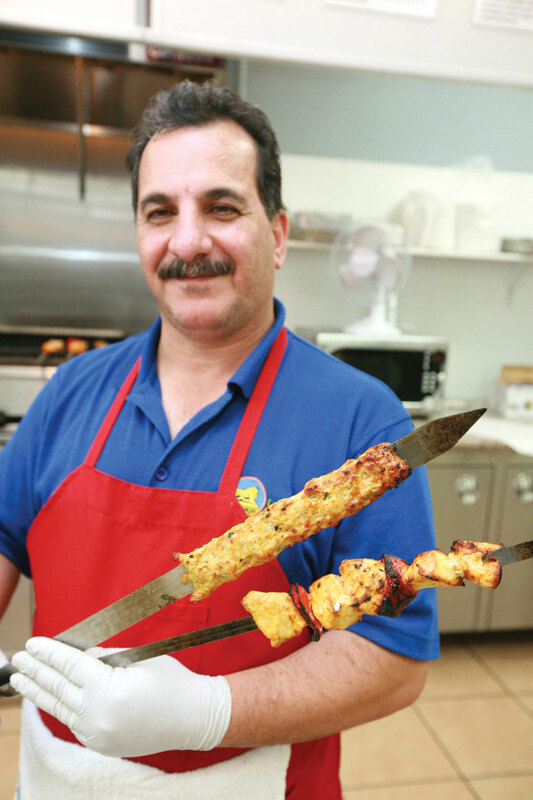 suffers from the fact that it is actually on my way from Downtown to Maalouf’s, so for years I drove by, read the sign that advertised kabobs and thought “I should try that someday.” Well, that day came and I was happy it did. This is the fanciest market of the three. 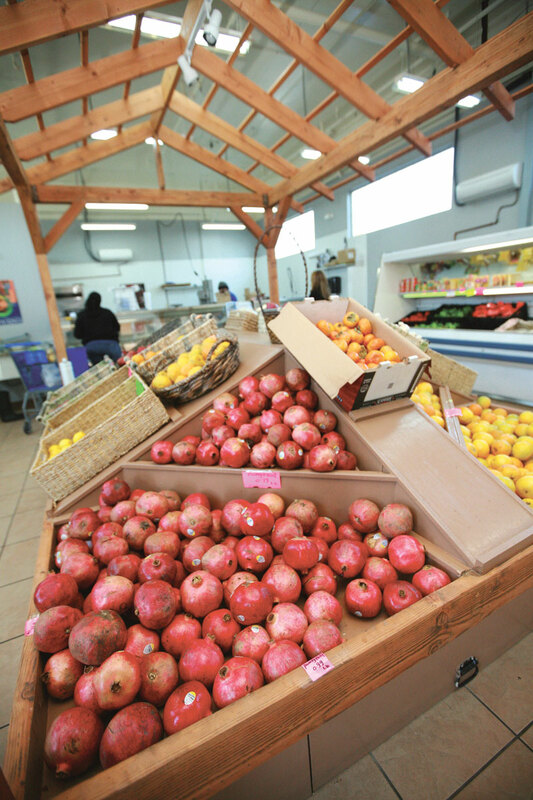 The imported food is displayed on handsome wooden shelves and in eye-catching stacks on the deli case. The meat area looks surgically clean and the market is bustling. Med. 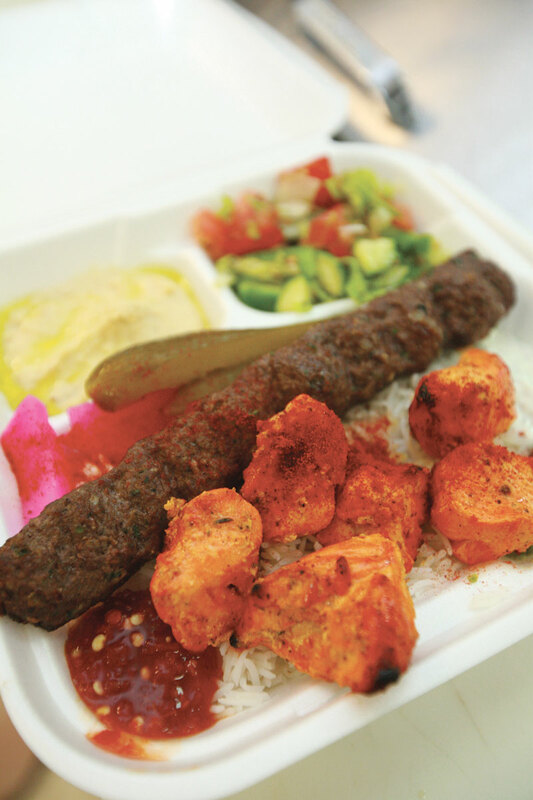 Market only serves one thing: combo plates that cost $5.49 and consist of chicken and beef kabobs. There is no seating, and they only serve prepared food around lunchtime from Monday-Saturday. It’s worth noting these details because you are going to want to try this combo plate. The entire plate is heavily seasoned with the tart spice sumac, and the mound of rice the meat rests on is soft and savory – worth eating, not just filler. The chicken is lemony and the well-spiced beef kabob tastes like the best meatloaf ever. The hummus has a strong chickpea flavor and isn’t as rich or creamy as some versions. I bought a couple of sides here as well. The tabbouleh was uniformly chopped but surprisingly heavy on onions. The dolmas are a must-buy; they’re lemony and luscious – completely addictive. Of the three markets, International Market has the best food overall (the pickles and yogurt sauce put it over the top), Babylon City Market has the best bread and the chance to try some uncommon Iraqi dishes, and Mediterranean Market has the cheapest meal and the best selection of grocery items. Now if I can just think of a dish to make using chickpea flour, grape molasses, and mustard oil, I’ll be set.